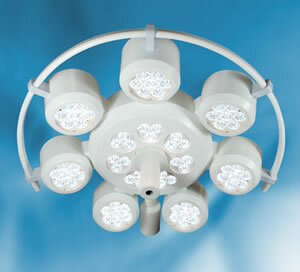 OT - STARLED 7 is the surgical lamp that opens a new era in the illumination field for the operating room. Ceiling mounted complete with extension arm. The high quantity of LEDs circularly positioned and shared out into 7 groups (with 3 LEDs each one) around the handle and other 7 groups (with 7 LEDs each one) radially positioned into the handle, represents a great news for OT – STARLED 7 to generate with a total of 70 LEDs a light spot of 21 cm @ 1 meter, with a high illumination level of 160.000 lux and a life cycle of approximately 50.000 hours. ACRIS® patented system The extraordinary and innovative combined system ACRIS® patented by ACEM ensures the control of electrical curves typical of LEDs by the use of a microprocessor, keeping them unaltered over time but maintaining a life cycle of about 50.000 hours. OT – STARLED 7 boasts a rendering colour index of 95 and a colour temperature of 4.900 °K. These two values allow to reproduce the exact chromatic scale of the colours of the human body. OT - STARLED 7 is provided with a Brightness Adapter to distribute the LED light quantity in a more regular way producing a homogeneous light on the surgical field. For these reasons, ACEM has created and installed on this new lamp a device that, thanks to some obstacle detector sensors, spots the surgeon’s head, shoulders and hands constantly. The Brightness Adapter operates automatically and in a clever way by intensifying the light beams of free areas and decreasing the light intensity of the temporarily darkened leds. The shadows generated by darkened areas are immediately diluted and compensated by the beams in illuminated areas producing a homogeneous shadowless light and ensuring intensity, steadiness and reliability of illumination on the operating area under every condition. Accurate studies have induced ACEM to create and patent the first and innovative I – SENSE® control system based on digital, hygienic and easy-to-use controls for the surgeon and the medical team. I - SENSE® is an accurate, functional and easy-to-read system provided with an operating parameters storage that simplifies the switching among the different operational modes (standard, automatic, ambient). Besides, it is possible to have the remote control (optional) to run the functions of the light and have a better efficacy and functional capacity for the end-user. OT - STARLED 7 has a practical and functional design. Its outstanding manoeuvrability is possible thanks to the central and lateral handles that enable the medical team to move the lamp maintaining its full stability and high illumination performance while operating. ACEM design takes into consideration the sanitary requirements. For this reason OT – STARLED 7 has been manufactured with a smooth and resistant material that makes cleaning quick and easy. Moreover, the pratical and confortable handle is removable and autoclavable. OT – STARLED 7 can be produced in different configurations based on the heights and needs of the operating room. The lamp shape is particularly suitable for laminar flows. Its structure has been studied on purpose to avoid obstructing air flows inside the operating room reducing considerably the turbulence areas. OT - STARLED 7 is provided with ACS (standard) video camera integrated inside the central handle of the light head, otherwise the video camera can be placed on an additional arm too. ACE (Zoom) or HD camera are optional. Thanks to its modular design, OT-SYSTEM allows to expand, if required, the use of multimedia in the OR and can be supplied as a twin dome lighting system (composed by two OT-STARLED 7), with a satellite (OT-STARLED7 combined with STARLED5 or STARLED3 EVO PLUS) or further configurations up to four arms. OT – STARLED 7 twin dome and OT-SYSTEM composed by OT-STARLED 7 and STARLED 5 can be provided with synchronized controls (optional) to grant simplicity of use as well as the possibility of being managed by a single operator. OT – STARLED 7 thanks to the AVSM system (Acem - Video - System - Management) is compatible with the whole range of ACEM video cameras and monitors. OT - STARLED 7 is suitable for surgical illumination in the operating rooms and is provided with the new technological LIGHT UP® system conceived by ACEM that, thanks to its special light beams, gives the possibility to adjust and regulate illumination levels according to the different applications. The light beams coming out from the upper part of the light head enable to visualize distinctly the surgical field maintaining the correct vision of the environment. This kind of technology has been studied on purpose for minimally invasive surgery becoming ideal for the preparation and attendance during the operation and monitoring of patient or operations with the use of microscope.